When we moved to the farm three years ago It was a wreck. Mike had just finished the refurbishment at our old home and just as we were starting to enjoy it he asked if we could go and view this ‘bit of land with a house’ he had seen. It was a complete dump! a tiny four bedroom house that the estate agents were describing as ‘unliveable’. But, we could both see the potential and given that it could offer us a life we dreamed of (and the fact we both have a screw lose) we took the plunge. 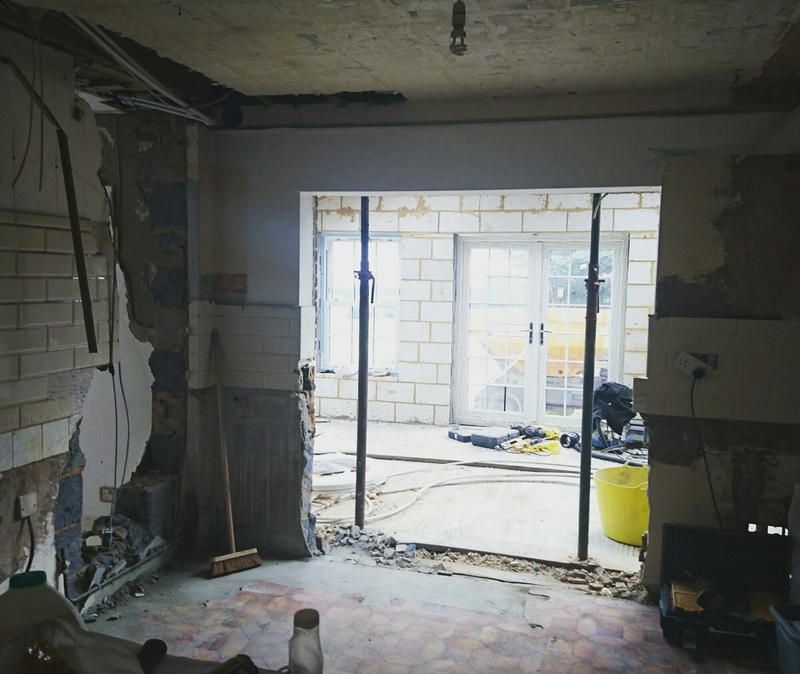 I will write a post about ‘surviving an extension / refurbishment’ but for now I’m just going to brag about my kitchen. I say ‘brag’ because after living with a tiny ‘unliveable’ kitchen for over two and a half years and then a building site for another three months I feel like I earned it. I can’t offer much advice on how to cope with having a new kitchen fitted because, quite frankly, I’m not sure I did cope! 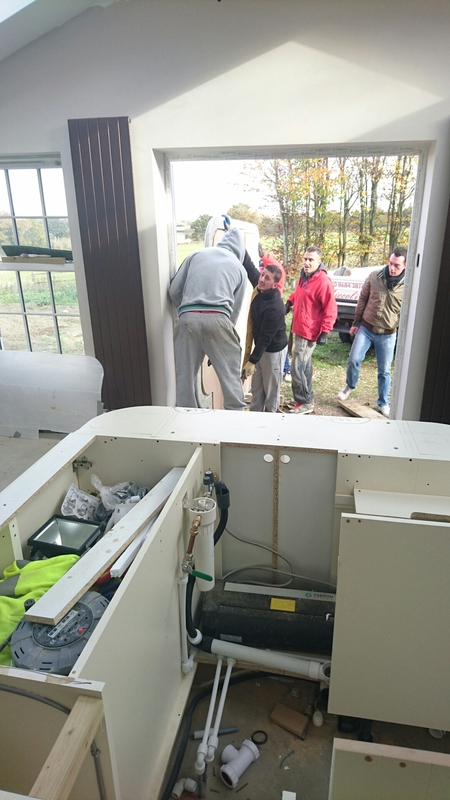 Our builders were great and made sure I always had a cooker and a sink (most of the time). Although, I won’t lie, we became great friends with our local restaurants over that three months! I ll let you know how I got my perfect kitchen…. I knew I wanted a country kitchen that was in keeping with a home on a farm but anyone that knows me will tell you there is a bit of a Essex girl in me fighting to get out and that girl loves a bit of glitz and glamour. So I’m going to say the look I settled on was classic, country glamour. I Googled and looked through pintrest to get an idea of what i wanted. -The Amtico flooring that I have throughout the rest of my downstairs was a must for the kitchen. 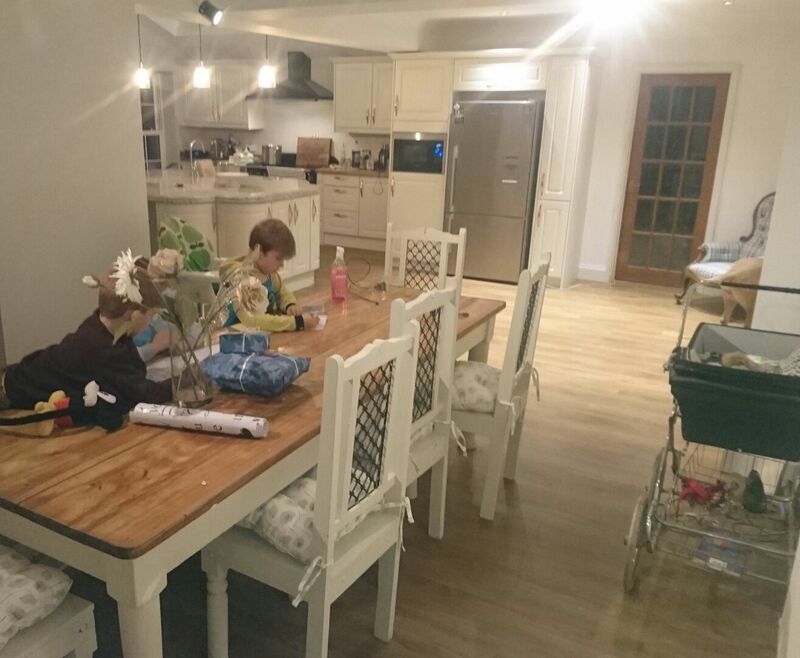 We love to entertain and the kitchen is always the hub of our house. With five kids, six dogs, a husband that loves shooting and given where we live we need a hard wearing floor that doesn’t show every speck of dirt. Our Amtico Tradional Oak Spacia is perfect for that. It is so easy to keep clean and always looks smart. I ordered this off the internet, if you go into your flooring shop and ask for a quote you are likely to go into cardiac arrest! -I love stone worktops. Granite, marble, Composite, Quartz, I love them all! I don’t love the price but I do think it adds something to a kitchen, and as long as you don’t pick black (a mistake I made in an old house) it is easy to keep clean and always looks lush. -I bought a rangemaster induction cooker when we moved into this house. Given that is was only a couple of years old and we were on a budget I had to keep it. Once it had a professional clean looked fabulous. Induction for anyone that doesn’t know is an instant heat hob that is heated by a magnet. Food doesn’t burn onto it so its really easy to clean and if you put your hand on the hob it doesn’t burn you (great for the kids and husband) . 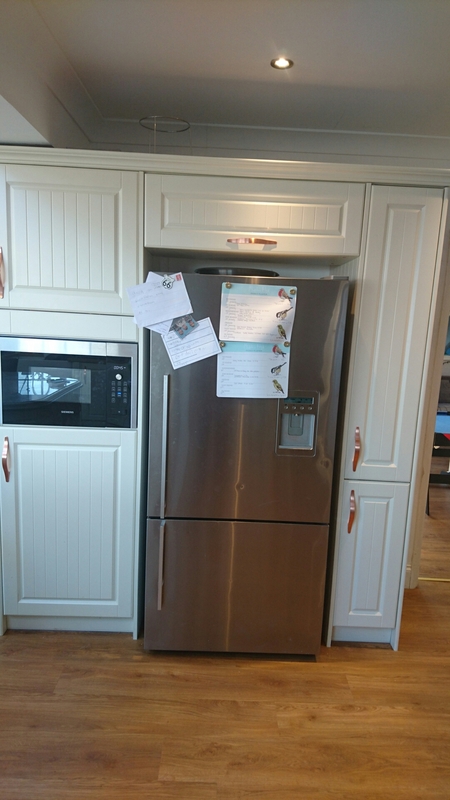 -My fridge/freezer is Fisher and Paykel. They were the only manufacturers that had a fridge/freezer that had a water dispenser but didn’t loose the space inside the fridge to store the ice and water tank. With a family of seven, soon to be eight we need as much room as possible. The Ice drops straight into a drawer in the freezer section. So again, the kitchen had to be worked around that. 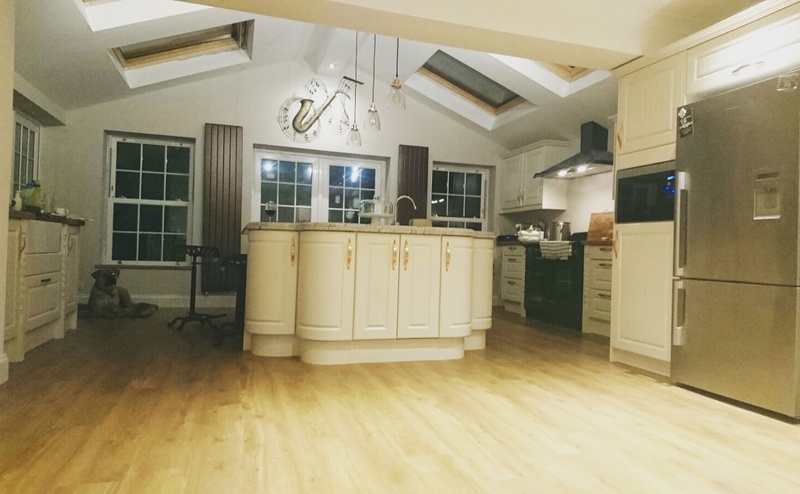 I found a local kitchen supplier (Cathedral Kitchens, Sanderstead) who did a great job at planning the kitchen. I knew roughly how I wanted to lay it out but he suggested the curved units and building a unit around the fridge. I gave him a budget and a rough idea of what look I wanted and he showed me what he described as his ‘kitchen that never dates’. He has been selling it for years, a Crown kitchen in the Heathfied range. I knew I wanted copper accessories and when I was shown the copper handles I knew they would be the perfect finish. The kitchen units and handles came in at a great price. If you think that the local independent kitchen shop is going to be expensive, go and check it out, I think you might be surprised. 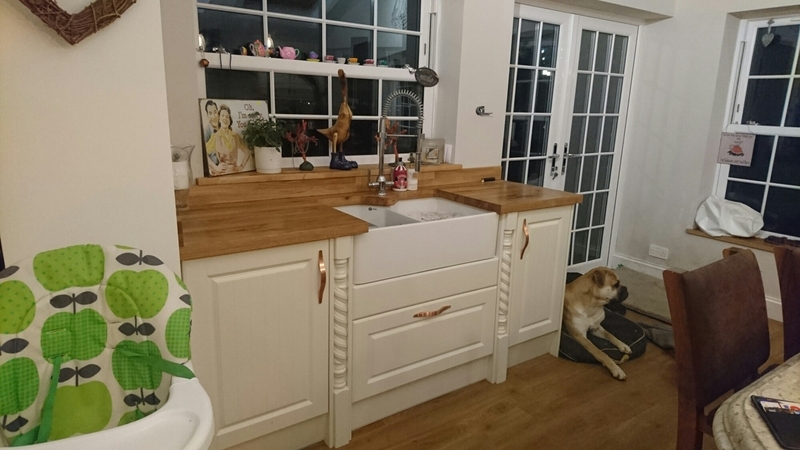 Our two worktops are solid wood which I ordered from Worktop Express online. They were so much cheaper than any shop or local supplier and the quality is really good. At the price I paid a few people questioned what they would actually look like but my builder said they are great quality. 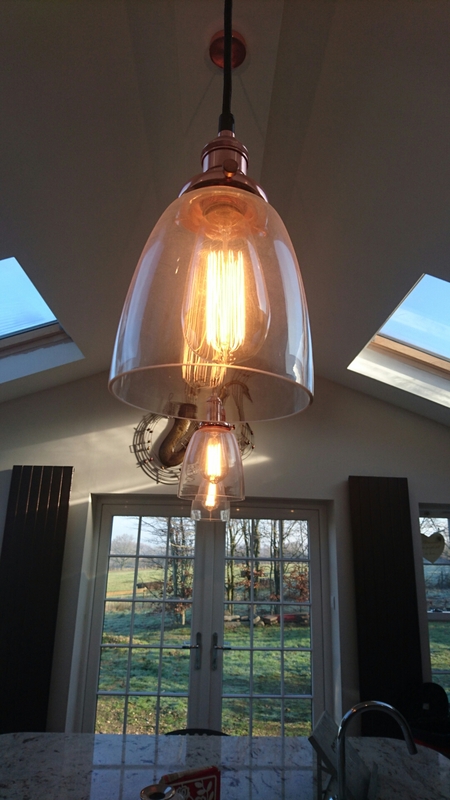 The three lights over my island I ordered off Ebay for £39.99 each and they are a talking point of the kitchen. In the evening when we are all sitting around the Island having a drink, the lights (on a dimmer) really create an atmosphere. 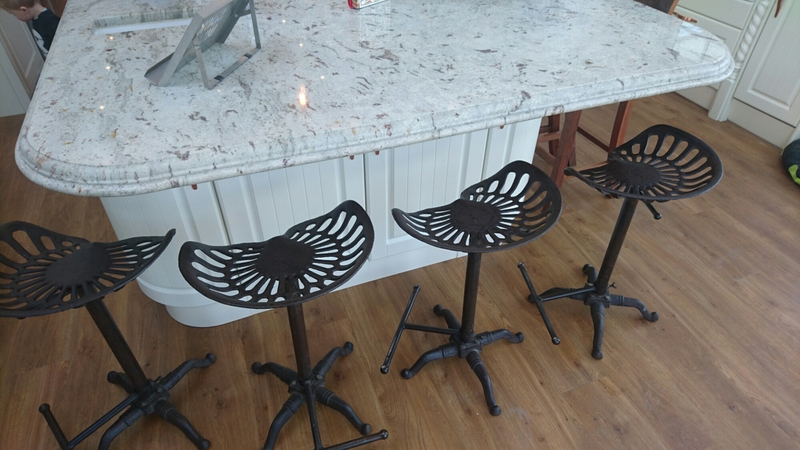 My tractor stools were from Melody Maison online and cost £54.50 each. They add that rustic farm feel to the kitchen. My two copper effect radiators were £100 each off an Ebay heating shop, a total bargain and a bit different from an average radiator. 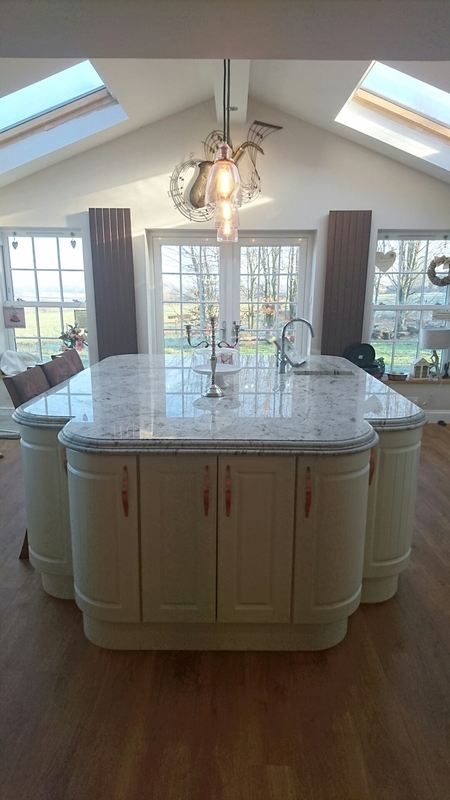 The focal point of the whole kitchen has to be the Island worktop. I rang various people from online companies to local people and I was quoted anywhere from £5,000 – £8,000 for this. It was money we didn’t have but a part of the kitchen I wasn’t prepared to compromise on. What made it even harder was that mike wanted an edging to the stone that nearly doubled the price. I called a local company to us who store their own stone in a huge warehouse. I couldn’t believe my luck when they showed me an off-cut, big enough for my Island. The only problem was, because it was granite, a natural stone, it had some slight orange markings. This meant it would be hard for them to sell, but with my copper finish I thought it would look great and As it happens you could barely see it. I managed to get my Island worktop, made and fitted for under £3000! If you live in the South East and would like more details on this company feel free to email me. 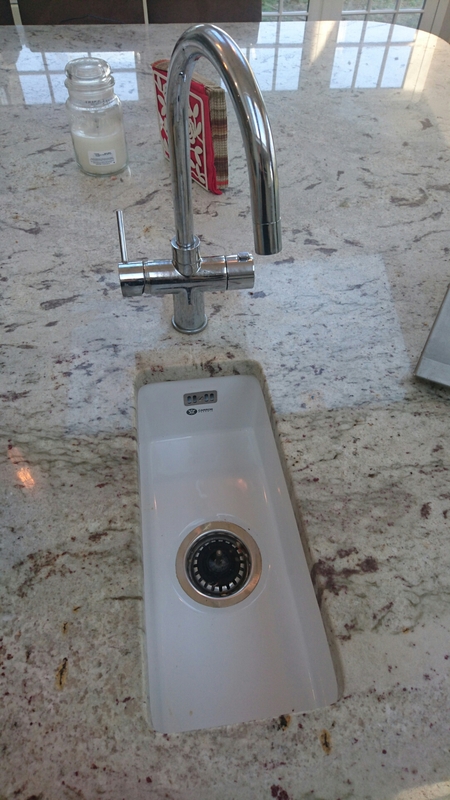 Together with a couple of extras, my Belfast sink…..
and a small wash sink in the island with a boiling water tap, a total necessity for any new kitchen (tea and coffee on tap…literally and no kettles taking up worktop space) my kitchen came together! Unfortunately, dispite having a fantastic decorator, by this stage money was tight and I decided to paint and paper myself. 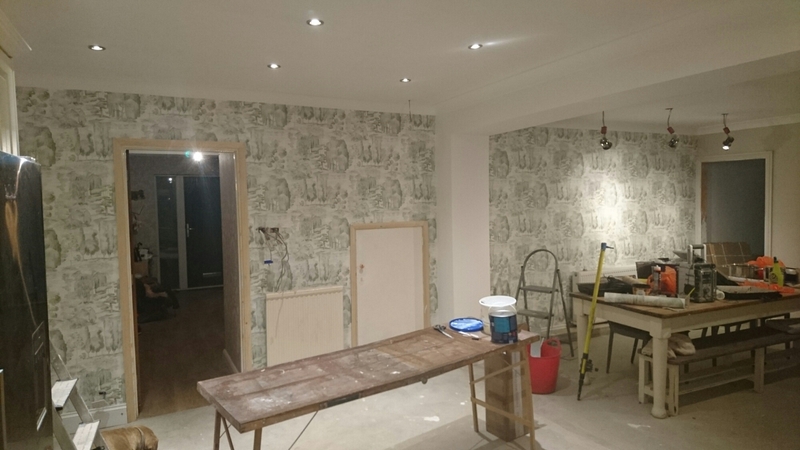 I am a nightmare for wallpaper! I love it and every room in my house has at least one wall papered. Because the French doors all open up to our garden and fields I knew I wanted something which brought outdoors indoors. A tree theme preferably in a green that would set off perfectly with the copper and cream. 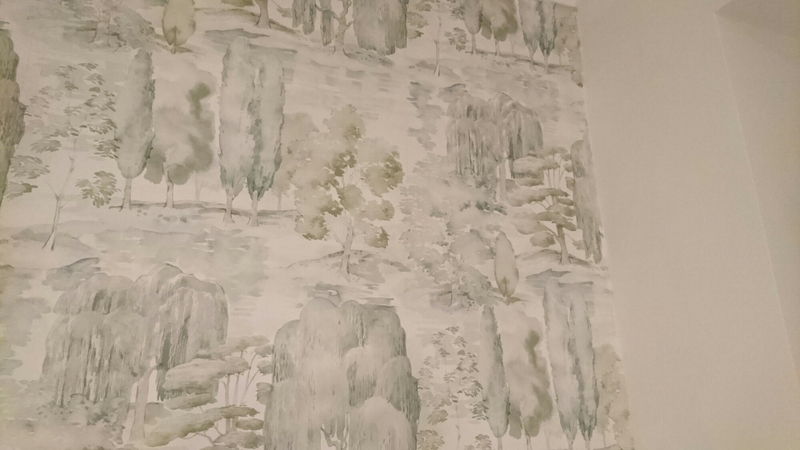 After browsing the net I found Sanderson Waterperry, Its not cheap at approx £44 a roll, but It was only for the one wall and I have Sanderson wallpaper in my lounge and the quality makes it worth it. One of the things I hadn’t thought about when we were doing our kitchen was how much it would bring us back together as a family. Now instead of everyone going of into seperate rooms we all spend time together, playing, cooking, eating or just chatting in the kitchen. 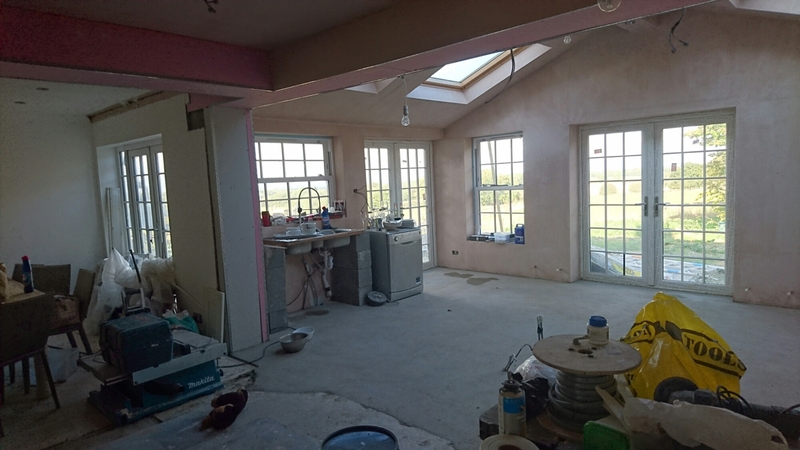 If you want any more details on the kitchen or our fabulous builders,(S.W CONSTRUCTION 07956161721) who I can not rate highly enough please email me katethompson485@gmail.com.